If your doors don't operate properly in the way they close, it can usually be adjusted given some fundamental steps to go by. Although, you may need to become somewhat familiar with your door and the way it is built and has been installed in order to do so. Occasionally on an interior door and more commonly for an exterior door, one of the hinge screws is larger than the rest (longer and possibly with wider slot head). This attaches the door to the stud and also affects the upper tilt (assuming that it is positioned high, normally the case). By screwing tighter, the door is pulled closer to the jamb which may be enough for it to close properly. Noting that before tightening, if this screw has loosened, there is normally an uneven vertical gap along the door edge to jamb - assuming that it was installed level when it was hung. It is possible to replace existing hinge screws with larger matching screw(s) to cinch the jamb nearer to the framing. Not only to serve as adjuster screws but to help stabilize the door position. When a door hits the stop unevenly, and by a minor amount - tap it even with a hammer and a block of wood. It should close at the perimeter at the same time. When off by a distance, or if the stop is bowed, it will have to be removed and replaced. Making minor movements toward the outer jamb is likeliest given the flat mould side and the other tapered profile. To reduce the gap between the door-edge-to-jamb on the latch side, it is possible to gain minimal amounts from the hinge side. Simply place cuts of cardboard or similar behind the hinge plates. If the door is swollen, first make attempts on drying the wood and once reduced back to the preferred dimension, top and bottom end-cuts should be sealed. Remove the door from its jamb by popping the hinge pins. If the pins are seized, tap a punch or nail-set in through the bottom opening (pins can be greasy). Next, stage the door. Most do-it-yourselfers will be using an electric planer. Look into the core and gauge how much backset there might be, and how much of this might be reasonably reduced. Noting that some brands of hardware are more fixed than others, requiring greater distance. If there is enough space, and most doors can take a minimal reduction, then prop the door upright. With a small carpenters square, verify that the door edge is square on the door - if it is angled, the stock might have to be removed at the same angle, so if you think this is the case, place the door back on the jamb and verify any necessary angle. With the door hardware removed, set the electric planer depth gauge. You might want to mark the door backset with a pencil before applying the bevels. Observing all safety precautions throughout. When removal is complete, reinstall the door at the hinges. Given a proper fit, contour the two sharp corners with a sanding block like the other edges around. If the door edge is angled for closure then you might have to either put it on a table saw for cutting the angle, or go to a woodworking shop. Wood shops are usually equipped with roundish blades that are used to contour the consistent edges. The masonite door (like six-panel artificial woodgrains) will have to be removed to although with masonite, the material should be cut rather than planed. When the door is planed or sawn (and preferably not belt-sanded!) on the handle side, the bolt plate should be chiseled to a lower mortise to remain flush. 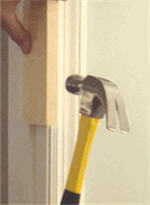 If the door hits the jamb striker plate when shutting, unscrew the striker plate, chisel and replace.